Description: Check out the red bell. Description: At the north yard. Title: BNSF 2339 and 2727 wait for Amtrak to pass. Description: The switcher is BNSF 3611, which, hopefully, is going north for a H3 paint job. Description: On a spur track in front of the Amtrak station. Description: On a spur at the Amtrak station. Description: I headed over to Portland to catch the steam locomotives. At the 6th St underpass I caught this local returning to the yard. The grain train from the first picture is still there. Description: The Empty Execumac Coal Train is abount to pull up to the Vancouver Yard Office for a crew change. Description: Amtrak 452 rolls past Vancouver Yard as it arives at VAncouver Station. Description: BNSF 2339 enters the stub track by the station after finishing its work. In the background BNSF 2727 performs switching duties. Description: BNSF 2339 with a cut of 5 cars and a BN caboose has recently tied down after switching in Vancouver. Description: The 2339 was here during my first trip (8/25/12, day after i helped move my brother up from my Springfield, OR. my home #1) and according to the other pics on this site, shes been here for years. 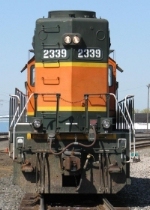 At this time in October 2012 the 2339 which retains its old BN number, and was built as a Frisco unit, has been performing daily duties on the BNSF transfer into oregon. Description: AMTK 73 moving down into the station on the west side of the wye, the east arc crossing at the bottom of the frame & joining to the east along the split for a portion of the BN switching & sorting yard where BNSF 2339 and 2133 perform their duties, keeping the main clear. The southern edge of the wye crosses somewhat behind the photographer arcing from the east along the Columbia River gorge entrance to the train bridge (where the Amtrak is headed in this frame). Description: BNSF 2752 - BNSF1599 lower yard sorting duty shuffle a string up onto the upper yards as the rain starts to fall on BNSF 2339 and BNSF 2133 waiting to do their own sort in the Lower BN yards by the Amtrak Station in Vancouver, WA. Description: BNSF 2339 topping off in the service fill track. Description: BNSF 5013 and group in the power holding line, BNSF 1550 to the west of the inspection shed, and BNSF 2339 on a yard pair all linger about while the action takes place on lead tracks, mains, and sort yard off to the side. 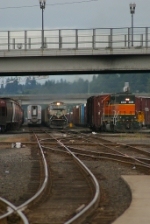 Description: Crowded Service Station (from right to left): BNSF 4683, NS 9787, NS 9367, BNSF 974, BNSF 4993 (under sanding tower); BNSF 1779 (wearing BN green-white hazard nose) and BNSF 1550 to the right of the inspection pit shed; BNSF 5013 in power line-up wanting nothing to do with the UP hidden mostly behind the shed, but _almost_ in line; and a yard pair headed by BNSF 2339 just barely visible over the tops of the real power. Two unspecified switchers on active duty in the background while a coal drag slips past on the main-line pair. Description: BNSF 2339 on the service track at the rear of the maintenance area leading toward the shed - possibly just needing a little rinse-and-spit. Description: BNSF 2339 in the middle of the Geep-pack currently staging an occupation of the Vancouver power corral displacing those boring behemoths that usually trample the ballast.